Before you hit the road or fly the friendly skies there are numerous preparations and precautions to take to make the experience easier for you and your pet. Traveling with pets can be nerve racking and frustrating, so after you take your own dose of valium to calm you down here are some things to think about. 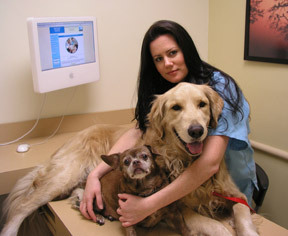 A copy of your pet’s recent medical problems and the phone number to your veterinarian’s office should accompany you. Knowing the phone number to an emergency hospital along the way if you are driving, or at your final destination if you are flying, can also be information you should gather ahead of time. If you are a client of the Long Beach Animal Hospital and you have an emergency when you are out of town call us and we will interrupt one of our doctors to talk to you or another veterinarian. When crossing state lines or flying it is always a good idea to get a health certificate within 10 days of leaving. If you are traveling to a different country this is mandatory. Certain countries do not have some of the diseases we encounter in the U.S. and have very stringent requirements upon entry so as to keep these diseases out. Please be sure to research these requirements carefully, and even think about hiring a professional pet travel service to guide you in this paperwork if you are going to an unusual destination. Plan far in advance to sort out this paperwork because of inefficiencies in other countries and stringent requirements (not to mention the bureaucracy). Put a current ID tag with your phone number on a secure collar. Microchipping is very popular, and most locations have scanners to properly scan your pet. If your pet is crated place your name and contact information, along with a copy of your pets medical records, on the outside of the crate. When deciding on a crate or carrier size is important. Make sure your pet has room to stand up and turn around during the trip. Check with your airline for their policy on type and size of crate, and whether your pet will go under your seat or in the cargo hold. In cold weather and in the cargo hold of an airplane put in several fluffy towels for warmth. Let your pets spend time in this crate prior to travel. Every airline has specific policies so check with them first. Your pet should not be loose in your car, so use that carrier again. It is far too easy for a scared pet to bolt out of an open door at a rest area, or fly out of a crack in the window. Cats are masters at finding the most inaccessible areas of your car when they are scared, especially under the power front seats. You might even have to go to the car dealer to have the seat unbolted to retrieve your cat. Also, what will you do when you apparently calm cat gets scared and one second later goes under the driver’s feet and ends up under the brake pedal? These scenarios, although unlikely, have happened before. Since most pet travel is in the summer heat stroke can occur easily. Stop often for bathroom breaks and to let your pet drink fresh water. Never leave your pet in the car unless it is in a shaded area and several windows are rolled down for proper ventilation. Solar powered fans are available to circulate air and keep your car cooler. When in doubt do not leave your pet unattended in the car due to the serious potential for heat stroke and death. If your pet suffers from anxiety please see your veterinarian about tranquilization. This medication also has an anti-vomiting effect to help prevent car sickness. Give the medication several days prior as a test dose to see how your pet reacts. On your travel day give the tranquilizer several hours prior to leaving to make sure it has time to take effect before the last minute commotion of departing. Try to schedule feeding so your pet eats only after the day’s car ride or flight, although make sure it has access to water. Feeding the night before the trip is an easy way to minimize car sickness and having to clean up a mess in your car. Take your car-sick prone pet on short car rides prior to any long trip helps in conditioning. Familiarity can help soothe your pet and keep it calm. Bring blankets, bedding, towels and toys your pet is familiar with. Don’t forget its favorite food and a leash.